Dr. Cindy Mathena is the vice president of academic operations and dean of post professional studies. 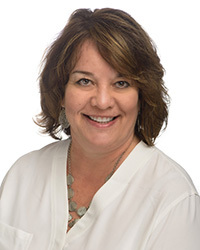 She has served in several positions for the University of St. Augustine for Health Sciences since joining in 1997, and was instrumental in the launch of distance-education programs. Her responsibilities include oversight of online education, accreditation, continuing professional education, residencies and fellowships, and post-professional programs. Previously, Dr. Mathena served as an adjunct professor for Old Dominion University, Virginia Commonwealth University, and Tidewater Community College. She also served as executive director for Tidewater Center for Technology Access in Virginia Beach, Virginia. Dr. Mathena has 10 years of clinical experience. She served as occupational therapist for Rebound Rehabilitative Services and was a staff occupational therapist for Virginia Beach City Public Schools and Riverside Regional Medical Center. Dr. Mathena was a contributing author of Pediatric skills for Occupational Therapy Assistants (Mosby Elsevier, 2000). In 2013, she presented on outcomes assessments at the Distance Education Accrediting Commission (DEAC) annual conference in San Francisco. Dr. Mathena serves on the DEAC site accreditation team and is the co-chair of the Educational Standards Committee. She is an active member of the Florida Occupational Therapy Association and the American Occupational Therapy Association.